Looking for skip hire Homerton? It’s amazing just how much junk accumulates during the year and getting rid of it all can be a real headache. 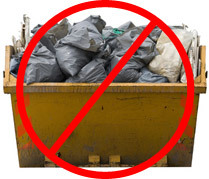 You might think that skip hire Homerton E9 is the answer but have you thought about permit issues, problems with space, access to your driveway and even the opinions of your neighbours? Away With It provides a viable and cost-effective alternative to ship hire. For our trained specialists and flexible lorries, even the most challenging project is not a problem for us! We are not saying that normal skip hire in Homerton E9 does not have its value. In fact, if we think skip hire would be a better alternative for you we will be happy to arrange this for you at a competitive price. Still, nothing beats the flexibility of our trained teams. Boasting over fifteen years experience in this massive industry, countless customers throughout Homerton have chosen Away With It as their rubbish removal specialist of choice. We hope you will be next! As opposed to the “set it and forget it” mentality of many companies which offer skip hire in Homerton E9, we are here to work with you whenever you need us. Our lorries are available on short notice; even within the same day that you call us. Upon arrival, we will remove all of the rubbish that is necessary and make certain that your property is left in truly pristine condition. If you need to reschedule or you require multiple trips, we are more than happy to adjust our time frame accordingly. So, sit back and relax…Away With It has your needs covered. Arranging skip hire Homerton has never been easier. First, give us a ring at either 0208 504 7390 or 07957 123 019 and speak with one of our friendly representatives, or alternatively make use of our handy online form for a quick and easy quote.